Niagara Falls is arguably Canada’s most recognized destination worldwide. While the U.S. side has the more natural New York State Park protecting its pretty shoreline, the commercially developed Canadian shore actually does boast of a closer and more dramatic view of the Falls. 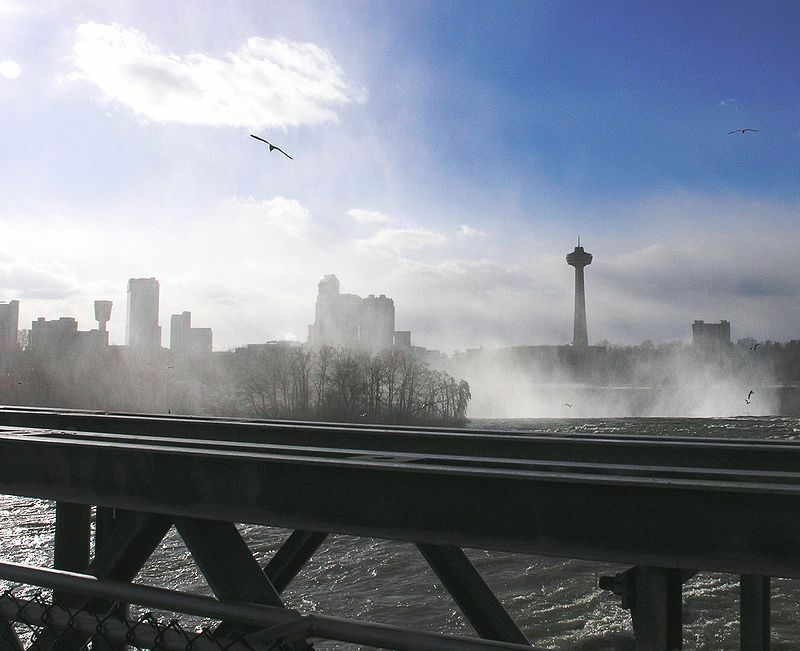 Yet, both the Canadian and American sides of Niagara Falls attract a wide mix of visitors, from the typical honeymooners to die-hard family travelers. Why not take a second honeymoon, with the kids this time? When you hear the name Niagara Falls, what images come to mind? The Three Stooges? Someone going over in a barrel or walking across on a tightrope? Around such an incredible natural wonder, there has been a history of dare-devilry — some who decided to take on the falls made it, and others didn’t. Luckily, most have been content to watch from the water’s edge, as the Niagara River, which links Great Lakes Erie and Ontario, plunges down through the American Falls and the Horseshoe Falls on the Canadian side, part of the Niagara Parks government-run system. Tourism has been prevalent in the area since the early 19th century, and while the surrounding attractions have changed with the times, the thundering falls have remained, just creeping slowly upstream from erosion. In addition to contemporary attractions, Niagara Falls has parks of interest for nature lovers of all ages. The Butterfly Conservatory is full of beautiful winged creatures that fly around an enclosed area and may even land on your shirt. The Botanical Gardens, including an herb garden, vegetable garden, and rock garden, is tended lovingly by the students at the specialized School of Horticulture. Bird Kingdom is now the world’s largest indoor aviary, but there’s more. Explore the rain forest and night jungle, tour a “lost land” that houses tropical birds and animals and play with the resident lorikeets. In the past few decades, from brand name, upscale hotels to professional golf courses and the flowering of nearby wineries, the Canadian Niagara region has undergone a renaissance. To lure honeymooners and families into longer visits, interactive manmade activities such as the Ripley’s Niagara Falls Canada – Believe It Or Not! and 4D theatre, the Louis Tussaud’s Wax Museum, and the wacky Odditorium are promoted in addition to the beautiful sceney. These attractions are found up on Clifton Hill, the wonderfully kitschy central street full of miniature golf, arcade-like games and rides, and other entertaining tourist oddities. Obviously, this helps make Niagara Falls an entertaining destination for kids as well as a nostalgic choice for parents and grandparents. Some visitors, however, balk at the very commercial nature of the clifftop road for despoiling the view, and therefore prefer the US side. Canadian tourism officials thank casinos for rejuvenating the region, and gambling is very popular. Projects like the Fallsview Casino Resort contain a hotel, galleria and the Avalon Ballroom Theatre, where well-known Canadian and American acts appear, to the nightlife scene. Amazingly, Niagara Falls has continued to attract honeymooners (and those on second honeymoons, with kids) from every country — especially China and India — ever since Napoleon’s brother brought his bride in the late 1800s. All newlyweds who register with the city receive a honeymoon certificate entitling them to some two-for-one offers on attractions. Tourism officials run festivals throughout the year to drive business in the off season, as well as offer visitors extra activities. Annual events include the very popular Festival of Lights running from November 18, 2017 to January 31, 2018. Throughout summer, pop up suppers are served at various venues that showcase the region’s agricultural bounty and tasty wines. Check calendars for costumed historical events and re-enactments at Old Fort Erie, the ca. 1764 British Fort about a half hour’s drive from the falls in Fort Erie. An archaeological team from Wilfrid Laurier University works there every summer to uncover artifacts from life in Niagara prior to the War of 1812. The Niagara Falls Marathon is held in October. The race starts in Buffalo and makes its way across the Peace Bridge, ending at the Canadian falls. There are also summer and off-season festivals on the American side of Niagara Falls, which can be reached by foot over the Rainbow Bridge. Luckily, since you’ll be staying in one of the top tourist destinations in the world, you won’t have a lack of choices in accommodation on either side of the border. (If crowds don’t interest you, you may want to avoid the Clifton Hill area.) It pays to shop around, since packages are often available, especially in the cold (but beautiful) winter off-season. The Canadian side of the Falls enhanced its family appeal enormously when Great Wolf Lodge opened in Niagara Falls, Ontario. The all–suite, indoor waterpark resort is designed in Great Wolf’s signature national-parks-log-cabin-style, and has over 400 suites. Within a vast entertainment area including a games arcade, there is a 103,000-square-foot indoor water park, with a wave pool, waterslides, interactive wet play area, pools, a lazy river, and family and adult whirlpools. In summer, guests can go outside and try the smaller outdoor activity pool. The company claims that 5 million liters of water–no match for the Falls–are filtered through the waterpark each hour. If the Great Wolf Lodge is not to your liking, here are just a few suggestions of properties that welcome families as warmly as honeymooners.
. It has spacious rooms with two queen beds, large living areas and pullout sofabeds. Clean and contemporary rooms sleep four easily (six if you have little ones). Its location behind the Incline at Table Rock is so convenient, and the views over both the Horseshoe and American Falls are almost priceless. The hotel also includes a made-to-order breakfast for all in its rates, and has a hot tub and sundeck for a break from the sightseeing. Note that in Niagara Falls, Ontario, there are properties “At the Falls,” amidst major tourist attractions, and “North of the Falls,” still within walking distance of the downtown area. On the American side, most hotels are in “downtown” Niagara Falls, New York, so do check a map before you arrive and unload the car. When it comes to dining, you’ll be spoiled for choice, though things are generally tourist-expensive. A good value Adventure Pass is sold at the Incline ticket counter and many other attractions; for a discount price, you get admission to the Butterfly Conservatory, Maid of the Mist, WhiteWater Walk and Journey Behind the Falls. The pass also provides unlimited use of the Incline and the PeopleMover (a green public bus) which runs down Niagara Parkway past many attractions. With younger children, consider paying individual attraction admissions, as they will probably wear out before you get to all of the ones included in the pass. When it comes to dining, you’ll be spoiled for choice, though things are generally tourist-expensive. For more information, visit Tourism Niagara and Niagara Parks.